Discover the richness of living in the Kingdom of God right here on earth. Do you long for a deep, intimate connection with God? Are you hoping for a day when His Kingdom is realized here on earth? Do you wonder what the Bible has to say about bringing that Kingdom to your everyday life? The Bible is filled with teachings about the Kingdom of God it was one of the core messages Jesus proclaimed. The One Year Heaven on Earth Devotional, written by acclaimed author Chris Tiegreen, will take you on a journey through these teachings, exploring what it means to live as a Kingdom citizen right where you are. Enrich your life with God's wisdom, power, and love as you examine the nature of the King and both the opportunities and responsibilities of being part of His Kingdom in the world today. The Kingdom of God is here among us and you can be a part of bringing it to life in your family, in your community, in the world. The One Year Heaven on Earth Devotional by Tiegreen, Chris was published by Tyndale Momentum in October 2015 and is our 29794th best seller. The ISBN for The One Year Heaven on Earth Devotional is 9781414376745. 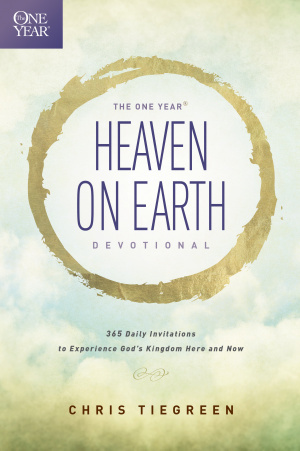 Be the first to review The One Year Heaven on Earth Devotional! Got a question? No problem! Just click here to ask us about The One Year Heaven on Earth Devotional. Does this devotional contain bible readings in addition to the authors thoughts and roughly how long are they?